The show was rebroadcast in December 2010 and apparently Oz’s recommendation went viral in the form of an e-mail with the subject line “Precautions re Mammograms and Dental XRays/A Useful Warning.” The e-mail message cites The Dr. Oz Show and retells the story of a woman who said she never would have known to ask for a thyroid shield when getting her mammogram if it hadn’t been for the show. “This gives women another reason to question whether or not they need a mammogram,” said Phil Evans, MD, director of the University of Texas Southwestern Center for Breast Care, while a guest on a “rebuttal” episode of The Dr. Oz Show in April of this year. “All these little controversies are dissuading women from having mammograms,” added Daniel B. Kopans, MD, a professor of radiology at Harvard Medical School and director of breast imaging at Massachusetts General Hospital, another guest on the April episode. “If you want women to get mammography, do everything you can to make it safe,” he said during the April show. Kopans says it is too early to determine the large-scale effect of Oz’s statements regarding thyroid radiation from mammography. At the breast imaging center at Massachusetts General, a few women coming in for mammograms are asking for thyroid shields each day; however, he has not seen any detectable decrease in patient volume. Statistics cited in the ACR/SBI press release show that for annual screening mammography for women aged 40 through 80, the cancer risk from the amount of radiation scattered to the thyroid during a mammogram is “incredibly small,” measured at less than one in 17.1 million women screened. They stress that this “minute” risk of thyroid cancer be balanced with the fact that using a thyroid shield could impact the quality of the mammography image, interfere with the diagnosis, and ultimately result in the need for a second mammogram. “As we told Dr. Oz, it was not just the fact that a thyroid guard was unnecessary and could compromise the mammogram, the concern is that misinformation over inconsequential issues will discourage women from participating in screening and its potential to save lives,” Kopans says. While on the show, Evans showed a mammogram image where the patient was wearing a thyroid shield. In the image, viewers could see where the shield slipped down into the field of view, blocking some of the breast and necessitating a repeat mammogram, exposing the patient to more radiation. Another doctor on the April show, Jocelyn Rapelyea, MD, associate director of breast imaging at the Breast Imaging and Intervention Center of George Washington University, explained that since the initial Dr. Oz Show episode, many patients visiting her practice for mammograms had asked for shields, necessitating repeat views 20% of the time. “The bottom line was that there was no risk to the thyroid with mammography, so a shield was not needed and that it could compromise optimal imaging,” Kopans says. “Dr. 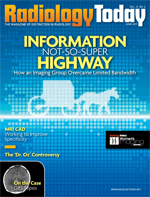 Oz dismissed the compromised imaging, suggesting that we often didn’t understand risk until many years later and that he was going to stick with his recommendation. In 2009, recommendations regarding breast cancer screening from the U.S. Preventive Services Task Force (USPSTF) stirred controversy by withdrawing its recommendation for routine screening mammography for women aged 40 to 49. This recommendation reversed the task force’s 2002 recommendations for breast cancer screening beginning at age 40. The task force also concluded in the 2009 recommendations that the decision to start regular biennial screening mammography before the age of 50 should be an individual choice between a woman and her doctor, taking into consideration specific benefits and harms. The benefits of early breast cancer detection should be weighed against the potential harm of a false-positive finding or the increased exposure to radiation, according to the task force. Within a matter of days, imaging and women’s health organizations spoke out against the 2009 USPSTF recommendations and to date, gynecologists and radiologists continue to recommend that women begin screening mammography at age 40. “The ACR and the SBI reviewed the USPSTF analysis and found that this group of individuals lacked expertise in breast cancer care and failed to understand the fundamental scientific evidence and that there guidelines would result in numerous lives being lost that could be saved by annual mammography,” Kopans says. “A recent review concluded that, among women now in their 30s, as many as 100,000 lives would be lost unnecessarily to breast cancer by following the USPSTF guidelines.” Concerns continue regarding the impact of this latest mammography controversy and the potential setbacks in early breast cancer detection it could cause.